Quote Reply Topic: Climate-change were you are. A busdriver did not want water getting in the way after a large amount of rain https://www.youtube.com/watch?v=QKFeKz5tFXY so the passengers did get their feet wet. Rainwater is stopped at the dykes on wich the railways are made. So this kind of waterproblems is not uncommon. https://www.youtube.com/watch?v=SS67CWKb8vQ This is not uncommon after a large shower. https://www.youtube.com/watch?v=Ot1KfCoQtXQ Parking getting flooded. https://www.ruimtevoorderivier.nl/english/ To deal with to much water in the Netherlands they have made extra room for the rivers. So you can control the flooding. https://en.wikipedia.org/wiki/Urban_heat_island On the other hand you need water to cool the surroundings during a heatwave. In my region they have made extra room for the (Lower)Rhine but also made vissible an old stream, a brook, wich can deal with both to much water or to much heat. Also more green, trees, vertical gardens against walls-http://www.countryliving.com/gardening/garden-ideas/how-to/g1274/how-to-plant-a-vertical-garden/?. Vertical gardens on soundscreens along highways are supposed to have a cooling effect, clean the air, and reduce the noise of traffic. In the Netherlands political parties claim to encourage cycling. http://www.snelfietsroutesgelderland.nl/arnhemnijmegencycling In my opinion they are not doing enough yet. Other EU-countries are planning to stop alowing fossil fuel transport in several years. For many cities more bikes, less cars, saves a lot of money and pollution. https://ecf.com/what-we-do/urban-mobility/fast-cycling-routes Other cities, regions are interested in what bikes can mean for their regions https://www.velo-city2017.com/. My question to you was how are you prepared when things get worse, which they will. I do not know how bad climate change will get. The daisyworld theory seems to hold reasonably true, but does not protect any one species; we could be one of the unlucky ones. I can't see Earth becoming like Venus, but things could change radically. If anyone wants to know how the use of all the stored carbon could make things go. Then look at the geological period that existed before it was stored away the first time - namely the early carboniferous. Additionally, as the climate stabilizes at the new temperatures, there should be massive changes to wind and water currents; greening of deserts and desertification of lush areas, hurricanes becoming more frequent, stronger and covering a wider band - not just tropical areas. So the questions go: "How well prepared are you for those senarios?" Tech, I think that "abrupt climate change" could be a realistic scenario. When I look at the public unrest after hurricanes I am not optimistic on how safety would work out when we-in NW Europe-would have to deal with a situation in wich there is no police, government etc. for days or weeks. Basicly I do not know what to prepare for. There are "risk-maps" in wich north of were I live wildfires are the main risk, but here flooding is a main concern. In a radius of 30 kilometers about 1 milion people live, in a 100 mile radius over 30 million. When they start to panic fellow-humans are a major risk. I understand you live in an area with minor risks for wildfires, flooding or large movement of public-in-panic. I try to stay informed, try to keep a good condition, know my ways. During the "cold-war"this region was supposed to be on the list of the Soviet Union for a nuclear attack. The bridges in this area are the main connection between the Northsea-ports and Germany. I guess that in a nuclear attack I will be history at once. Proberbly would not want to survive such a horror. Having a lot of food/drinks in a house for wich the main risk is flooding is not the best of ideas. So I only can hope that "things get wose" that slowly that I can see them coming. Proberbly in other countries public order will collapse earlier than in the Netherlands. On the other side of this "story" there might be "things getting that worse" you do not want to survive them. Preparing for some scenario's may have use, other scenario's proberbly prolong suffering. I am a winter sports enthusiast in the northern US state of Illinois, and used to live & play in Minnesota (borders on Canada). One of my favorite winter-time activities for the past 50 (!) years has been "ice fishing," whereby I trudge onto a frozen lake, drill holes and catch (or try to catch) any of a wide variety of species of fish. Over the last several years, ice fishing contests, which are a big deal in Minnesota, have been repeatedly cancelled due to insufficient ice thickness on the relevant lake. Some of these contests have been permanently cancelled because the annual cancelations were becoming more frequent. Just now, the Maple Lake Ice Fishing Derby has been cancelled. That’s bad. Ice conditions for the Eel Pout Festival have created enough concern to prompt vehicle restrictions, according to the Cass County Sheriff’s Office. Sheriff Tom Burch says vehicle traffic on Walker Bay during the event will be prohibited, but with the following exceptions: snowmobiles and Class 1 & 2 ATVs. All vehicles must be removed from the ice by noon on Friday. Motorized traffic is no allowed until Sunday at 10 a.m. This is a big deal because the Eel Pout Festival is different from the previously canceled ice fishing events. All those previously cancelled events, including Maple Lake, are in Central Minnesota, not far from the Twin Cities. The Eel Pout festival is way the heck up north, in a region where even with global warming affected climate, the ice still normally forms hard and thick. Ten years ago we had eight feet of snow on our hill every year and our underground water supply pipes froze. The snow has not settled for the past six years and our pipes have remained flowing. But the amount of rainfall has become incredible. Our well used to run dry for a couple of weeks each year and our yard was dry year round except for a bit of mud for a week or two while the snow melted. Now the well has not run dry for four years and each year the yard has gotten wetter. This year my yard is a pond and a stream. We have had to lay concrete slabs as stepping stones to get into and out of our barn! I would rather have floods than drought, but there are floods and FLOODS! This is going on and on; it is quite ridiculous! We will have to dig new and more voluminous drains to cope with climate change. I'm too old for this level of work. We used to have more fruit than we could can or freeze. The last three years it's been so warm in February that our trees have bloomed and then in March we've had a late freeze. No fruit at all this year. The little fruit that did set this year the critters got! I have no data to support this but I've lived in the great plains most of my life and it seems there are more tornadoes and much larger and stronger tornadoes today! Stuttgart Ar. used to be called the Duck capital of the world. It was nothing to get your limit in one day! The last few years there are very few ducks. We,re now driving to northern Missouri, up in the Chillicothe area to hunt. It's not cold enough to drive them south! I've spent many a day ice fishing in Minnesota. From setting on a bucket in the open to watching the Packers in a heated house. I have a friend that lives in St Cloud and that's a big part of their lives. If your truck or your house goes through the ice DNR charges you $1000 a day until you get it out! The last time i was up there 5 or ten years ago it was -28 degrees below at 2:00 PM! In the 19th century they had to make rivers in the east of the Netherlands being able to deal with ice-blockage. Parts of the river did defrost pushing ice to still frozen parts wich could do damage to dykes-cause flooding. Up to 60-70 years ago rivers could get that frozen cars could drive on it. We do not get ice in the rivers any longer. (So no ice-fishing either-must have been here as well in those days). Thanks, nice to hear from a fellow ice fisherman! I lived in Tulsa for a few years & enjoyed watching the eyes of the Okies get big when I told them we could drive on the lakes in our pickup trucks and go fishing!! These days, not so much. We do get an occasional cold winter from the erratic polar vortex (which whips around like a crazy snake, due to Arctic heating), but I'd have to drive pretty far north to feel confident to drive on the ice again. And I do miss those -30ºF mornings in St. Cloud, MN!! When you inhale, it feels as if you were shot in the chest!! Sadly, our lifestyles will change, and events like Hurricanes Harvey and Irma will probably be the new norm (torrential rainfall, increased extreme weather events etc.). We need to consider this for our preps. I've noticed that the dry periods in the summer are longer and more intense, and conversely, the winters have been much wetter. We're in the process of building a barn and outside yarding area so we can keep our cows in next winter to stop them churning up the paddocks so badly. Their current cowshed isn't big enough for permanent housing for 4 or 5 months. Our summers have been long and very dry recently. We've had to start irrigating our paddocks to guarantee grass. I do worry about grass fires, so we've taken steps to fit huge irrigation sprinklers in the paddocks that are on the windy side of our house, so hopefully we can drench them in the event of a fire and stop it before it gets to us. Immediately, Thursday afternoon, 12 July 2018, the Rijn and IJssel Water Board has imposed a total ban on the removal of surface water. This means that no water can be extracted from brooks, rivers, ponds and ditches in the entire management area of ​​the water board. This prohibition applies to both companies and individuals, large and small quantities. The water board closely monitors compliance with the ban. Illegal emitters risk a fine of up to 2000 euros. It has been regulated by law that the fire service may always use surface water for extinguishing purposes. There is no ban on the extraction of groundwater. The Netherlands is still far from the heat. Meteorologists from Weerplaza were shocked this morning by one of the calculation models that predicts the weather of next week: ,, Which indicates 40 to 42 degrees for 28 and 29 July, we have never seen that, '' says Ben Lankamp of Weerplaza. We also have a heatwave/drought. Hard to believe in wet, chilly NE Scotland. Our well is almost dry. In an attempt to eke the water out, we are collecting and using rainwater (saved) running the pump from the well for short periods every 3 hours (in the hope it fills a little bit between runs - we get a few drops each time but the water table is way down.) not doing any washing (Oh boy, does that build up!) using washing up water to water the plants, recycling dirty animal water as plant water and using bottled water. I smell! I cant bathe as much as I wish! The loo is only being flushed occasionally AND STILL THE WATER STORE IS DIMINISHING! There is no respite in sight. To add insult to injury, there is low cloud over us today. ; chilly, misty, but no real rain!! There is one consolation. Most of the midges have died and failed to breed in the hot, dry weather. Ha! Ha!Ha! Even mineature vampires can't take this sun. It gets toasty here in SoCal, but we just saw some extreme temps ourselves. 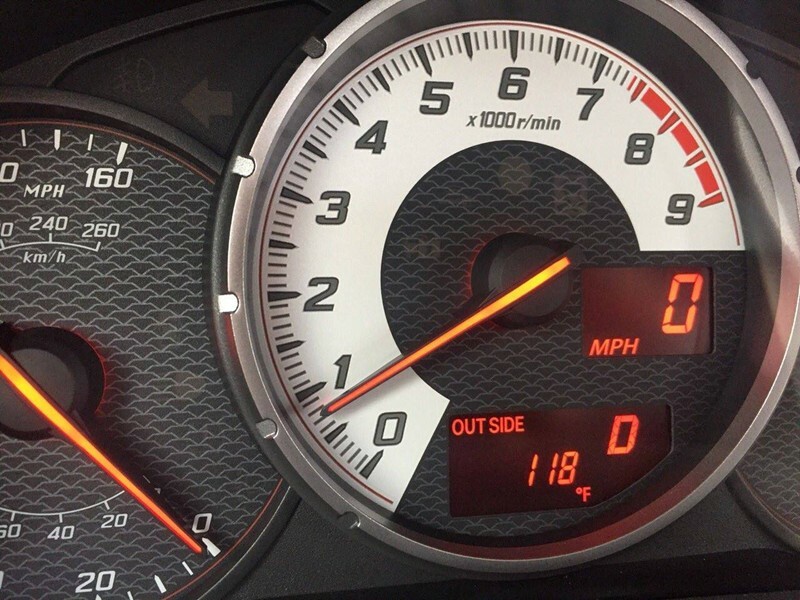 This is a coworker's dashboard thermometer during our recent heatwave. For the time being we still can take showers etc-but it is a worry ! Other places have to deal with far worse kind of weather. But it is all extreme and can become deathly on the longer term. No lakes for water for the toilet in Scotland Techno ? (To save drinking water ? )-I follow https://www.youtube.com/watch?v=ncXGLu_iVlc In2thinair and https://www.mrmbb333.com/-the UV(C) readings are quite shocking ! In my region the grass is brown/yellow, an early autumn for most trees....limited wildfires so far. Keeping the livestock and plants alive is our priority. No lakes near enough to be of any use, even the sea is a minimum of 15 miles away, with ice cold north-sea water and dangerous caves and currents. Nipping there for a swim with soap, rocks and a bag of washing is not really an option. We are even using the dehumidifyer as a water source!